Rani Ahilyabai Holkar Punyatithi is the death anniversary of Queen Ahilyabai Holkar who was the fearless queen who ruled the Malwa Kingdom in India. 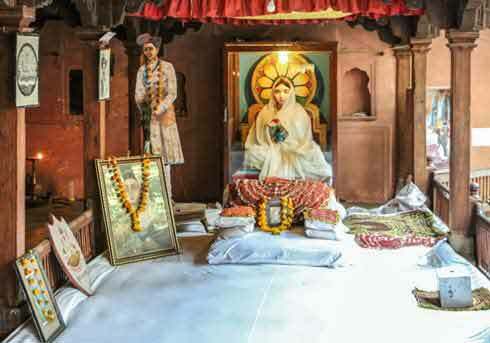 Rani Ahilyabai Holkar Punyatithi 2019 date is August 27. As per Gregorian calendar her death anniversary is on August 13 – She died on August 13, 1795. Rani Ahilyabai Holkar lost her husband in the battle of Kumbher in 1754. In 1766 her father-in-law also died and then she became the Queen of Malwa kingdom. She personally led armies against enemies of her kingdom. Perfect order and good Government prevailed and the people prospered during her 30-year-old rule. Rani Ahilyabai Holkar is credited with rebuilding numerous shrines including the famous Somnath Temple in Gujarat which was plundered and destroyed by Muslim Invaders. She also built numerous ghats, sacred places, temples and ashrams throughout western and northern parts of India. Some of the temples that she has repaired include the Vishnupad Temple in Bihar and Kashi Viswanath Temple in Varanasi. It is believed that she repaired more than 100 famous temples in various parts of India which were destroyed mostly by Muslim invaders. The great aspect of Rani Ahilyabai Holkar was she never used public money to build temples. She used her personal wealth for the purpose. Satsangs and philanthropic activities are organized on her death anniversary in many parts of India. As per traditional Hindu Lunar Calendar her death anniversary is observed on the Shravan Krishna Paksha Chaturdashi tithi or the fourteenth day during the waning phase of moon in Shravan month as per traditional Hindu calendar followed in Maharashtra and Gujarat. Ahilya Bai Holkar (31 May 1725 – 13 August 1795).